Nearest: Tube Station: High Street Kensington 0.3 miles (0.4 km), Railway Station: Kensington Olympia 1 miles (1.6 km), Motorway: M4 Junction 1 4 miles (6.4 km). The Royal Garden Hotel is superbly positioned on Kensington High Street (at its east end) adjacent to Hyde Park/Kensington Gardens. Kensington High Street is one of the most popular and fashionable shopping areas in London. Just to the North of Kensington High Street is another chic area at Notting Hill (0.6 miles). The hotel is adjacent to Kensington Palace and its gardens which was the former residence of the late Diana Princess of Wales. To the South of the hotel is South Kensington (0.8 miles) yet another nearby popular shopping area with Knightsbridge (1 mile) again close by to the East. Nearest attractions include Linley Sambourne House (0.4 miles), Royal Albert Hall (0.4 miles), Albert memorial (0.6 miles), Serpentine Gallery (0.6 miles), Natural History and Science Museums (0.7 miles), Earls Court and Olympia Exhibition Centres (both 1 mile). The Royal Garden hotel London has a high reputation and has often been chosen as the host hotel for major sports events, the first event hosted being the world cup (held in London) in 1966 when England won the Tournament outright. The bedrooms have a modern English style using place creams and classic accents from reds to blues. Rooms are furnished with natural wood furniture and art work. All rooms have their own bath and shower with free top brand toiletries, heated mirror, powerful hairdryer and bathrobes. Room amenities in all the Royal Garden Hotel rooms include two phone lines, triple glazing, lighting control panel, CD player, DVD player, Minibar, Individually controlled air-conditioning, wireless high speed internet access, flat screen Interactive television (with movies, games, 3000 album jukebox and internet browser), iPod dock, well stocked minibar, laptop size safe, desk area and windows that open. Executive Rooms are family rooms and will accommodate 2 adults and 2 children. 4 bedrooms are adapted for accessibility (2 executive and 2 superior standard). Min Jiang: 80 seat capacity, serves authentic Chinese cuisine. Striking blue and white Chinese pots and vases contrast beautifully with the contemporary deep red walls in this restaurant and bar combination. Traditional dishes from China along with speciality dishes including Dim Sum, spicy Sichuan and Beijing duck cooked in a wood-burning duck oven. Great views from this 10th floor restaurant out over Kensington Gardens. Private dining area for up to 20 guests and separate bar. Park Terrace Restaurant: Located on the lobby level (ground floor) of the hotel Informal and relaxed style. Serving snacks, afternoon tea, fresh British dishes, freshly cooked breakfasts (also buffet with healthy and oriental options) and informal dining throughout the day. Views over the Gardens and the driveway of Kensington Palace give a wonderful outdoor feel in the bar and restaurant. The restaurant is divided into three areas, the main restaurant serves a La Carte British dishes, a lounge area offering more informal options all day long and serving afternoon tea (Champagne option) , and a bar. Open for residents and non residents, the bar is a great meeting place for business or pleasure. Serves pots of coffee alongside the house Champagne and extensive range of drinks. Bar serves a snack menu with sandwiches and wraps. Bertie's Bar: Decor is cosy Victorian style, with wooden panels and a library of books. Overlooks the lobby area. Elegant and stylish with a sense of fun. Features a clear glass wall separating the bar from the foyer. The bar itself has a granite top finished with leather and textured glass panels. Large range of drinks are served which include 10 different types of wine sold by the glass, 12 speciality beers and no less than 15 malt whiskies. Snacks also served. All our guests are served nibbles along with their drinks. Soma Centre at the Royal Garden hotel provides a peaceful space in the heart of London where you can exercise your mind and body in harmony. The Soma philosophy is a holistic approach combining complementary and scientific therapies with mind body exercise - the perfect solution to today's hectic lifestyle. Beauty and massage treatments in the spa. Soma Centre -The Place Health club. Complimentary use of the gym, sauna and steam room for hotel guests. Offers personal training, complimentary therapy, A Pilates and Yoga. Kick boxing, Aerobics, dance classes and body toning. A small gym with cardiovascular machines and free weights. steam rooms. Also onsite is a business centre offering High Speed Internet access including wireless, PC with current Office applications, printing, Photocopying , fax, Document binding and laminating. Of course being a 5 star hotel the Royal Garden Hotel has a Concierge and twice daily maid service. Next door to the Hotel is the Connoisseur Casino. Other amenities include Chauffeur driven limousines and car hire, Valet parking, Hospitality Suite, Valet (laundry and dry cleaning), Mobile phone hire, in-house florist, Babysitting, Doctor and dentist on call, Safety Deposit Boxes, Currency exchange, Luggage unpacking and porter service, Multi-lingual staff, Overnight complimentary shoe-shine and 24 hour experienced Security team. Branding: Part of WorldHotels portfolio. Caesar Hotel: is 0.8 miles (1.3 km) away, has a guest satisfaction score of 81% and rates start from about £80. Washington Mayfair Hotel: is 1.8 miles (3.0 km) from here, earns a customer rating of 75% and base rates begin at about £169. Courthouse Hotel London: 2.2 miles (3.6 km), rated at 74% and with rates from around £174. Courthouse Hotel Shoreditch: 5.0 miles (8.0 km), rated at 89% and with rates from around £166. Worldhotels Hotels have an average guest rating of 81%. The Royal Garden Hotel with its rating of 89% is therefore not just well above average for this chain but is our highest rated Worldhotels hotel. Milesfaster ranking: 80th from 866 London hotels, 1st of 5 Worldhotels Hotels, and 46th of 131 five star rated hotels. 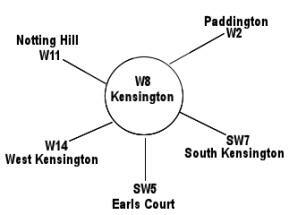 The closest fifty hotels around this area (2-24 Kensington High St, W8 postcode) that are listed on this website cover a 0.7 miles (1.1 km) radius. The star rating breakdown shows 4 five star hotels (average rating 92%), 30 four star hotels (average rating 81%), 15 three star hotels (average rating 74%) and 1 two star hotel (rated 71%). Top rated of the local hotels is the Milestone Hotel and Apartments (5 star) at 99%. Base Rates: Here we breakdown the starting rates (base rates) by overall average and by star rating. However base rates do not take account of special offers and one off deals so are just a guide. Looking at all the base rates of the 50 local hotels the average rate is £114 per night. Rates range from £11 at Smart Hyde Park View Hostel (2 Star, 71%) and the highest rates top out at £378 at Baglioni Hotel (5 Star, 91%). The following are the rate averages per star level: Five Star average: £219, Four Star average: £122, Three Star average: £77 and Two Star average: £11. We use a proprietary algorithm to rank hotels based on user reviews but adjusting for contributing factors. We rank Royal Garden Hotel 5th (joint) of the 50 local hotels and 3rd (joint) for the 4 five star hotels in the area. Our ranking for sheer lowest base rates is 46th of 50 (2nd of 4 five star hotels.). To give an overall ranking compared to hotels nearby we combine the rating and base rate scores which gives this hotel a ranking of 8th of 46 for sheer bang for buck (Smart Hyde Park View Hostel was top). The Royal Garden hotel first opened in 1965 and is notable as being the first London hotel to have broadband internet access available in all bedrooms. £45 million pound refurbishment 2010/2011. Total refurbishment 1994-1996.